The progressive and innovative spirit of Prince Edward Aqua Farms soon made the one-room building where the company had its humble beginning a memory. Today, it is a world-class shellfish processing facility with a quality control laboratory, a shellfish depuration facility and the ability to store up to 700,000 lbs. of mussels. We ship fresh, top-quality shellfish to markets and restaurants across the globe on a daily basis. Since being founded by five individuals in 1989, Prince Edward Aqua Farms has grown to meet the demand for their products, and to remain on the forefront of the dynamic shellfish industry. Expansions and advancements to the facility in recent years have resulted in an efficient and environmentally-astute processing plant with a full-time staff of 45 employees. The production system also boasts some of the most innovative and effective technologies that are used to protect the land and water in our region. Prince Edward Aqua Farms believes strongly in sustainable harvesting that preserves our environment and eco-systems. Recent innovations to the facility include improvements to the bagging and grading system as well the incorporation of a new ice packing process using slurry, or liquid ice rather than traditional flaked ice. This packing measure provides a more consistent temperature, keeps the shellfish colder and ensures a fresher product. Our customers enjoy fresher shellfish with a longer shelf life due to consistently colder temperatures. The dynamic growth and expansion of Prince Edward Aqua Farms over the years has raised the profile of the company. 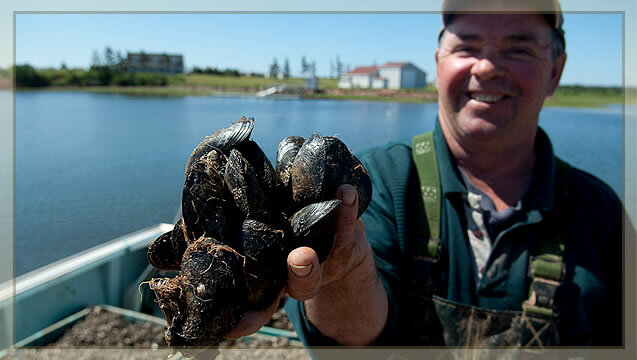 The management and staff maintain their original mandate – to produce the highest quality and best tasting Prince Edward Island shellfish 365 days of the year.